It's a personal watercraft that is designed to become whatever its user requires. In addition, the developers are already creating more configurations with their Open Design policy. When it comes to boating, there’s no shortage of options and activities for fun on the open seas. Sailing, kayaking, and motor boating are a few such activities; however, they all require specialized equipment. HYPAR is the world’s first patented personal smart boat that can be quickly transformed into a backpack, kayak, sailing boat, a solar electric boat, and much more. When folded the device can be carried anywhere as a lightweight backpack making it easy to handle, transport, and store.The modular design of the ship provides a combination of performance and versatility which is enhanced by a modular design, an advanced folding characteristic, snap connectivity, and high-tech materials. 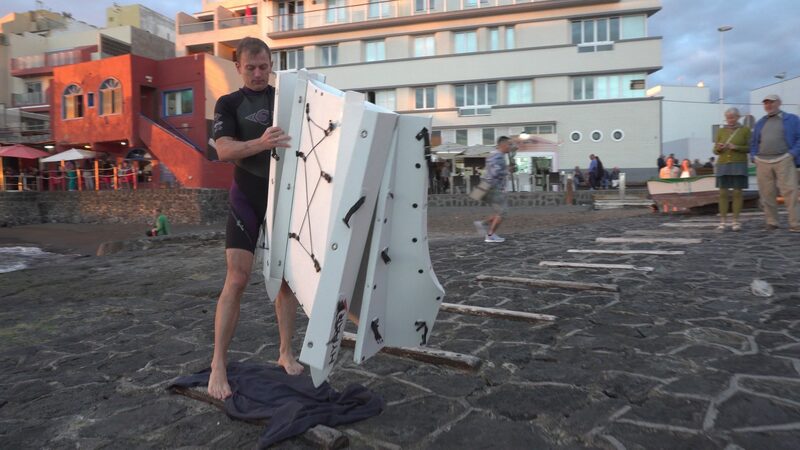 The shape ensures speed and stability while the folding design enables the device to transform from boat to backpack in three minutes. The ship is shaped of two counterpoised hyperbolic paraboloids. This shape inspired the name HYPAR, and makes it possible for the ship to deliver high speeds and stability in a lightweight form factor. 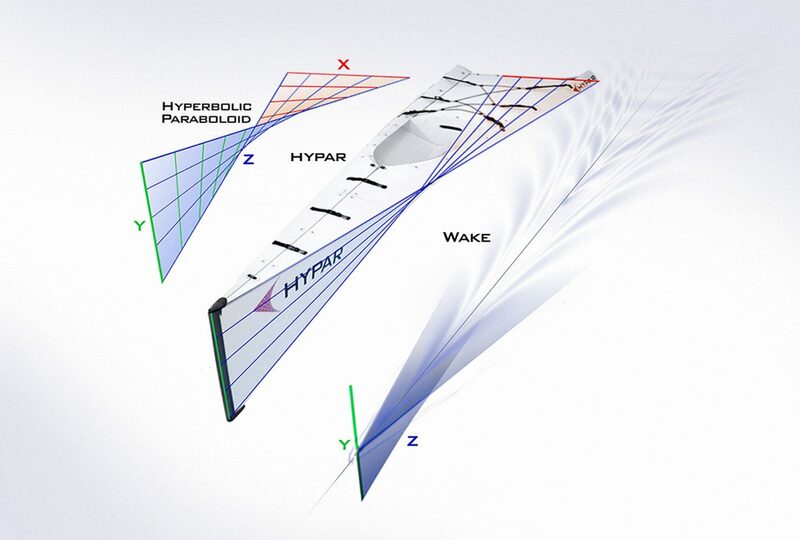 The makers of HYPAR are currently testing a few configurations including a sailing mod (complete with sails and rigging, controlled by foot pedals); a solar mod (solar unit designed as unified block of light, solar panel, MPPT controller and DC engine); along with a surfing and fishing mod with other configurations in the works. The concept in its self is an adaptive platform designed to evolve over time. The makers mention they are working on an Open Design policy which lets anyone contribute personal ideas and refinements. HYPAR weighs 22lbs and can carry up to 220lbs. The boat is sized 985”x31”x15” while the case is sized 31”x9”x40”. The ship’s material is made in close collaboration with DS Smith France, a European plastics manufacturer. It is comprised of a grade of advanced reinforced plastic which has the form of a honeycomb cell matrix. It’s polypropylene material Akyboard™ specifically adapted for marine conditions, and it also is designed to withstand more than 20,000 repetitive folds. The ship was featured during the boat show in Düsseldorf last January and it also has been tested by Jochen Lettmann, a German canoeist who competed in the 1990’s in the Olympics, taking the Bronze in 1992. So far, the makers of HYPAR have raised over $31,000 via crowdfunding with an estimated shipping date as early as May 2017 for rewards. Early bird pricing for the device starts at $550 which is $200 less than the suggested retail price of $750. Wheres your lifejacket inverter boy. More than 200% of the funding needed speaks volumes for a boat like this. It tells me that boat lovers and users value the need for something like this on the market. I am intrigued. I can see how in a pinch, this would be a pretty neat product to have. Other than that, I am not sure someone that is into kayak’s and things like that will really put money done for this.